Scion XB Forum > Vendors > CARiD.com > Awesome Sale on RSR Wheels - don't miss! Awesome Sale on RSR Wheels - don't miss! If you're looking to get the very best for your Scion xB and save money in the process, use an advantage of new Awesome Wheels Sale from RSR! 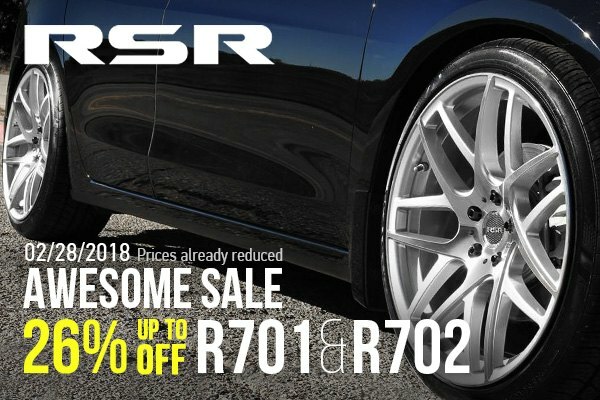 Purchase high-quality R701 or R702 Wheels from RSR and save up to 26% OFF the original price. Prices are already reduced. This great offer is valid through February 28, 2018. These wheels utilize the latest motorsport materials and manufacturing technologies. In addition to being the lightest structural metal available, they offer excellent fatigue resistance, denting and buckling resistance, and vibration dampening. Each wheel is produced by applying eight thousand times heavier pressure than casting. This process prevents porosity inside the material and creates homogenous metal structure at the molecular level, helping the material achieve high rigidity and strength. RSR brings both street and race versions to market with three different construction levels that offer the ability for a staggered set-up and include cast wheels with high-end finishing. They are available in various sizes to cover all your needs. Make RSR your wheels choice and enjoy your driving to the fullest!